Stormsaver has announced a new project with the Natural Environment Research Council. 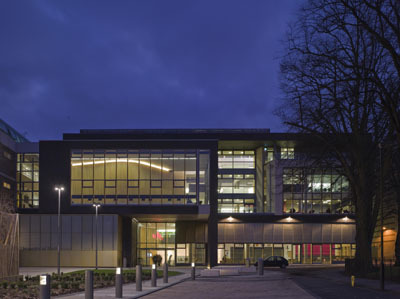 The James Hutton Building is part of a £6.5 million development at the British Geological Survey’s (BGS) headquarters in Keyworth, Nottinghamshire. The project will see the construction of a new two-storey office building for 100 scientific and administration staff, alongside the refurbishment of existing library accommodation. The refurbishment will provide a new main reception, conference and seminar facilities, a sales area and an exhibition space. Stormsaver has been contracted by Hiltons building and services engineers to supply a 20,000 litre, pressurised rainwater harvesting system. 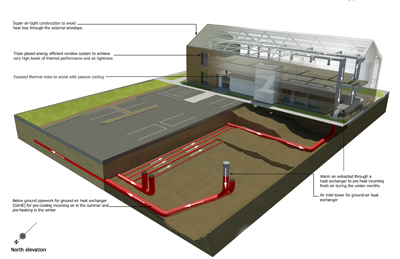 The below ground system will collect approximately 840m3 of rainwater each year from the centre’s 1,164m2 roof area, which will be used for the flushing of 14 toilets and urinals. The system will result in annnual savings of over £1,100, as well as helping to considerably reduce mains water usage. Alongside the Stormsaver rainwater harvesting system, the new office will have high exposed thermal mass to retain heat and mixed mode ventilation systems. The environmentally friendly features are intended to help achieve more than just a BREEAM ‘Excellent’ rating and dramatically reduce energy usage. Completion and opening of the development project is scheduled for spring 2012. 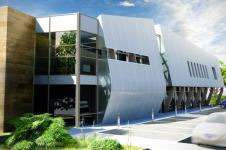 Stride Treglown architects are investing £65,000 in the installation on over 100m2 of photovoltaics on the roof and south facade of its new Cardiff Office to make it Carbon Neutral, believed to be the first privately funded office in the UK to do so. This investment follows the building’s achievement as the first BREEAM Outstanding Office at design stage in the UK with the highest score achieved of 89.12% in October 2009. Already performing well with building emissions some 40% less than current Building Regulations with a target of reaching zero, the building incorporates many energy saving features including a biomass boiler, high insulation standards, natural ventilation and a small array of photovoltaics. This much larger array of photovoltaics will enable net carbon emissions resulting from energy consumed in the operation of their space heating /cooling, hot-water systems, ventilation and internal lighting to be zero or better. Wrekin Windows has a new range of sustainable windows and doors on display in Manchester’s pioneering eco-house project. The eco-home project in Penzance Street, Manchester, features two terraced properties from the 1900s that Manchester City Council knocked together, re-developed and brought up to the standards of a new-build eco house, meeting BRE Ecohomes criteria. The properties were in a poor state of disrepair and had ‘hard to heat’ solid wall construction, typical of the period but the work led to the property achieving a Very Good EcoHomes rating for this type of home. Wrekin Windows’ latest window range is fabricated from Reco22, a 100% recycled window system, which achieves an ‘A+’ rating in the BRE Green Guide. The double doors installed in the eco-house also feature a doorframe fabricated from Reco22,, which has an aesthetically appealing white woodgrain effect finish to complement the door leaf. 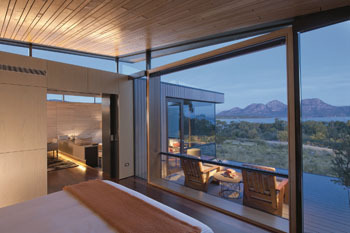 The eco-house was designed to showcase the concept of energy efficiency in a practical ‘hands on’ environment. Wrekin Windows had previously been involved in projects at Liverton Court, with Manchester Working and Northwards Housing, and the Manchester team were impressed with the Reco22 concept. Available in a triple-glazed bead and featuring a centre pane U-value of as low as 0.8W/m2k, Wrekin Windows’ Reco22 windows and doors range delivers significant in-life energy and CO2 savings. The Manchester eco house in Miles Platting showcases simple, everyday examples of how residents can reduce their energy consumption, with products ranging from low-energy light bulbs to solar-powered hot water and the improved insulation values and recycled content in the Wrekin Windows product range fit perfectly into this environment. The Manchester eco house has also joined the 'Old Home Superhome' project – a national network of homes that are open to the public to show great examples of energy-efficient measures in action. As a result of the refurbishment work, the Manchester City Council Energy Group calculated that both energy costs and CO2 emissions were cut substantially. In the case of Number 28, the carbon emissions fell from 5.2 to an estimated 2.2 tonnes per annum and the estimated fuel cost fell by over 50%. CMS Enviro Systems have been appointed by Lawtech to a £2m CESP (Community Energy Saving Programme) refurbishment contract in the Toryglen area of Glasgow. 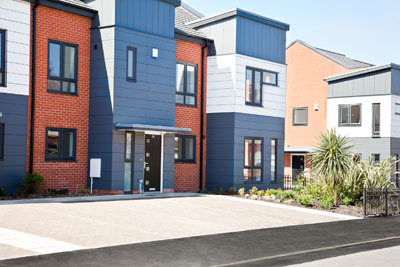 As part of an extensive CESP refurbishment, the £2m contract sees CMS Enviro Systems supply and install ‘A’ rated energy efficient PVCU windows and doors to Thistle Housing Association housing stock. The £20m energy efficiency and carbon reduction overhaul to properties includes: installation of energy efficient windows and doors; central heating upgrades; external wall insulation; air source heat pumps; and new solar roof panels. 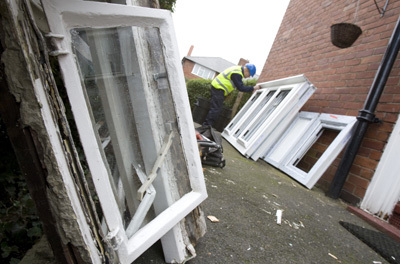 As well as the window and door replacement, the scope of work also includes the 100% recycling of all extracted windows and doors at the CMS recycling facilities in Fife. Jamie Hepburn, MSP for Cumbernauld & Kilsyth also said: “If CMS and businesses like it are able to thrive, our local economy is given a welcome boost, and our local communities benefit directly. 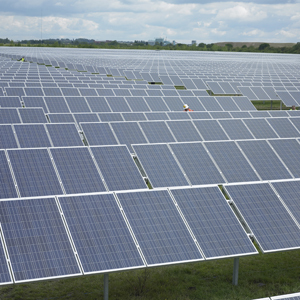 The Conergy Group has completed the UK’s largest solar power plant. The 5MW free-field park is situated in Hawton, near Newark on Trent in Nottinghamshire. 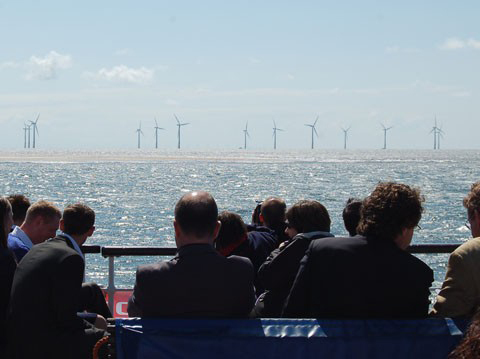 The fast-track project was built in cooperation with Conergy’s local partner Lark Energy and was completed only six weeks after receiving the planning consent on the 24 May 2011. The installation covers a total area of 14.6 hectares. 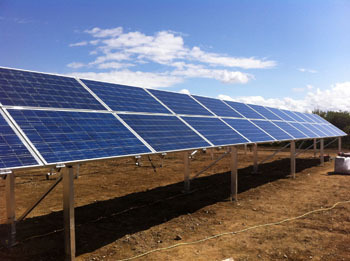 21,600 Conergy PowerPlus modules on approximately 40 kilometres of Conergy SolarLinea mounting systems were installed. Annually, the premium modules will produce 4,860 megawatt hours of clean electricity – enough to supply 1,300 homes. The local residents supported the green project from the beginning. A community research conducted prior to the installation showed that 100% of the respondents generally favoured the idea of solar energy as a clean, renewable energy solution with no emissions. 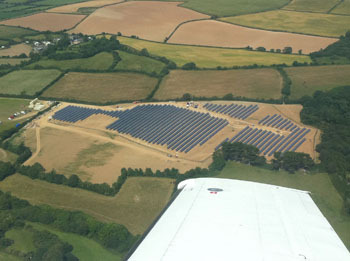 92% of those who came to an open event in March 2011 supported the Hawton solar park. “I am sure in time this could be a major opportunity for renewable energy to prove to be a major benefit,” concluded one respondent. In order to celebrate the successful completion of this project, there will be an inauguration event on Monday 01 August for the local community, media and other stakeholders. As the country’s main energy suppliers are set to increase their prices by up to 20% this year, the City of Edinburgh Council is helping council tenants cut their household bills. A modernisation programme totalling over £600,000 has provided a gas connection and a new and efficient gas central heating system for around 110 council houses in the Gateside area of Kirkliston. The improvements will save the tenants of these homes around £500 a year in their energy bills. A further 107 households in Kirkliston who have purchased their homes from the Council are also set to benefit as they have been offered a connection to the gas supply for a significantly discounted rate. Councillor Norman Work, Vice Convener of the City of Edinburgh Council’s Housing Committee and local ward councillor, welcomed the investment. He said: “The residents in Gateside have campaigned for many years to have gas installed in their homes and this Council has listened to their pleas by getting a supply put in. “This could not have come at a better time for many families as in the current economic climate some people are finding it very hard to pay their bills. In some cases, people are torn between paying bills and putting food on the table. Fiona Alexander, who lives in Maitland Hog Lane, has benefited from the new central heating system. She said: “The new central heating system has been great because we used to have these old electric storage heaters which weren’t good at all because they just ate your money! GML Construction has helped provide a bright new start for pupils at Dulwich Village Church of England Infants School with a new classroom extension that features an ultra modern interior of brightly striped walls, contemporary ceramic tiles, bespoke furniture and light wells. The £350,000 design and build scheme involved collaboration between GML Construction and the school. To help foster an excitement to learn, the school has pushed for an ultra modern interior, designed to provide an inspiring and engaging learning environment for their pupils. 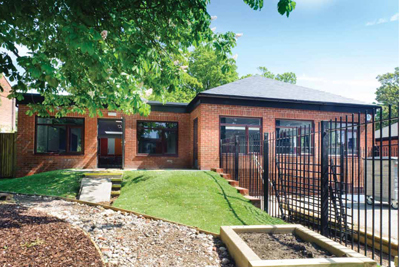 The twin classroom block replaces an existing building and externally features a brick skin and a part flat and part pitched roof with sedum green roof covering and featuring traditional slates. A living green sedum roof is also incorporated within the flat construction. The brick skin and slates were chosen to meet planning requirements by maintaining the aesthetic to the rest of the school. Internally the building is very different however. For maximum energy efficiency, the building also features high performance insulation and windows. To provide as much natural light as possible in the building, GML Construction has designed a central corridor that features light wells. These bring daylight flooding into the centre of the new space and along with the windows ensure ample natural light. The Rehau Awadukt Thermo ground-air heat exchanger has been installed in only the third office in the UK to be fully certified to Passivhaus standard. The new £1.5m East Midlands regional office for Interserve Construction in Syston, Leicestershire features some of the most advanced green building solutions to achieve a targeted 90% reduction in energy usage and costs compared with a traditional building. Because Passivhaus construction focuses on making the building as well insulated and air tight as possible, specifying the right ventilation solution is essential. In conjunction with environmental building services consultants Couch Perry & Wilkes, Interserve chose the Rehau Awadukt Thermo system because it was appropriate for the compact site and was more cost effective than a borehole solution. The two storey building will provide 680m² of accommodation. A 21m x 12m pipework array has been laid adjacent to the building beneath ground which will eventually become the car park. 250m of Rehau’s DN200mm collector pipework has been installed at an average depth of 2m along with 24m of DN400mm header pipe to deliver tempered ventilation air into the building pre-cooled in summer and pre-warmed in winter. The grid feeds directly into a plant room located at one end of the building where it is connected to a MVHR unit before the air is distributed around the building. The Rehau Awadukt Thermo system uses the natural temperature of the earth at a depth of 2m to pre-warm or pre-cool incoming air. Optimised polypropylene pipework maximises the heat transfer which takes place so that in summer incoming air can be cooled by up to 14º C and in winter it can be warmed by as much as 9º C, achieving a Coefficient of Performance of around 20. The system has particular benefits for an air tight building such as this one because it incorporates an integrated antimicrobial layer made from silver particles which eliminates the risk of microbial growth or musty smells. The new building has no gas fired space heating and relies for its heat on solar gain from its south facing aspect and from the tempered air delivered via the Awadukt Thermo and MVHR systems. A small heat pump is in place to provide additional warmth in winter if required. Rehau has also provided the triple-glazed fenestration solution for the building with 27 of its new Rehau Geneo windows installed across the south of the building. These Passivhaus certified windows achieve a U-value of just 0.8W/m2K using a six-chamber system extruded from a new high-tech fibre composite material branded Rau-Fipro. The new building has been constructed using highly insulated blocks with concrete infil, pre-cast concrete beams to provide some additional tempering, and is clad in timber to increase the insulation performance. Energy savings of 55% have been achieved following replacement of existing cooling plant with new Turbomiser chillers at Colt Technology’s West London data centre facility. Monitoring of power consumption by the client shows that after the installation of Turbomiser chillers, annual power consumption fell by more than half. The award-winning Turbomiser chiller was developed by UK based companies Cool-Therm and Klima-Therm, working in collaboration with Italian manufacturer Geoclima. Following the results, Cool-Therm is continuing to support Colt and reports achieving even greater power savings at other sites operated by the company. The results from the first phase of the project demonstrate the exceptional performance and efficiency of Turbomiser chillers, which run on virtually frictionless magnetic bearings. Colt has also been able to improve reliability and lower maintenance costs. Colt Data Centre Services asked Cool-Therm to provide a turnkey package, matching the existing data centre cooling load and maintaining cooling to the centre at all times during the changeover. After consultation with Colt, Cool-Therm advised that operation of all six chillers together would gain maximum compressor efficiency under inverter control, at the same time achieving maximum condenser efficiency due to the use of all heat exchanger surfaces to reject heat. The same logic was applied to the chilled water evaporators. Chilled water temperatures into and out of the data centre were increased from 6/12 deg. C under the original design, to 8/14 deg. C, further improving efficiency. A monitoring system was put in place to measure energy consumption against the previous system. Guy Ruddock, VP Operations, Colt Data Centres Services, said: “We are working with Cool-Therm to further enhance efficiency in our data centres, which contributes to Colt’s commitment to continual innovation to provide significant environmental and cost benefits for our customers. A Devonshire dairy has officially opened a £3.4m anaerobic digestion (AD) facility that will turn food waste from around the county into the energy helping to produce its clotted cream, ice cream crème fraiche and yoghurt. The renewable energy will not only power the dairy products production, but also export surplus energy to the National Grid. In its first five years, the Langage AD facility expects to produce 20,000 MW of energy saving the equivalent of 2,000 tonnes of CO2 a year. 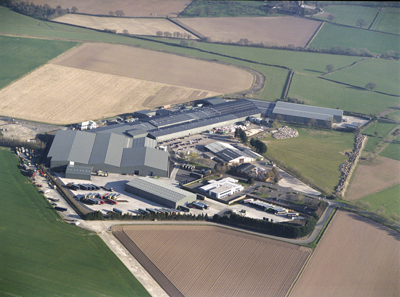 Lord Henley said: “The facility at Langage Farm is an excellent working example of how a localised closed loop economy can be created. EOS Energy is putting the finishing touches to a £3 million array of photovoltaic cells at Hendra Holiday Park in Newquay, Cornwall. The Warwickshire based company has been busy installing over 5000 units spread over 10 acres of land in recent weeks. At 1.15mw, this will be the largest array of solar panels installed under the Feed In Tariff (FiT) system. The operation has been vastly speeded up using the company's innovative BritSol mounting system. Managing director Gary Summers said: "The speed of installation has been phenomenal, at peak our engineers have been installing an incredible 1000 solar panels per day." To put the size of the project into perspective, the BritSol mounting system consists of 71000kg of aluminium – the equivalent of nearly five million empty coke cans. Hendra is one of the largest holiday parks in the South West, providing accommodation for up to 4000 holiday makers at any one time – 25% of people visiting Newquay stay at Hendra. The holiday park is aiming to reduce its reliance on fossil fuels by 50%. Hendra's current on site electricity consumption is over 1.5GW per year, with EOS panels installed their energy usage could now be cut by up to 50% – the equivalent of 400 residential homes! The Holiday Park also plans to use the solar PV installation as a free educational resource for schools and it hopes to use the energy savings to provide electrical vehicle charging points for free on site use by the public; part of a wider community investment in sustainable transport infrastructure. LDG Group, one of the North West's largest window companies, has just completed the installation of PVCU windows and doors for the prestigious £7m eco- development at The Saw Mills, an estate just a mile from Blackpool town centre and seafront. The 35 three- and four-bedroomed mews homes have been built on a former industrial saw mill site for the developer Great Places Housing Group by RP Tyson Construction, the project’s leading contractor, and the official opening took place in June. The homes, which were made available for shared ownership and affordable rent, reach level three in the code for sustainable homes which means the heating and lighting is very efficient and the materials are from a sustainable source. The £7m development was supported by an investment of £3.7m by the homes and communities agency (HCA). Working closely with the main contractor, RP Tyson Construction, Lancashire Double Glazing supplied 400 Grey 70 PVCU windows and 71 doors over a six-month period using Synseal Profile. While the project deadlines were demanding, the installation ran smoothly mainly due to the existing manufacturing infrastructure and large project capabilities at the LDG fabrication centre in Preston. LDG and RP Tyson Construction have a successful trading partnership stretching back over 20 years in which time both companies have gone from strength to strength working on high profile projects across Lancashire and the North West of England. Lee Plummer general manager at Lancashire Double Glazing said: "This is the second major project we have work on alongside RP Tyson Construction recently, and it was very satisfying to oversee such a prestigious and valuable project that ran as smoothly as it did. I think credit needs to go out to both the construction team at Tyson's and the fabricators and installers at LDG for such a good job well done." 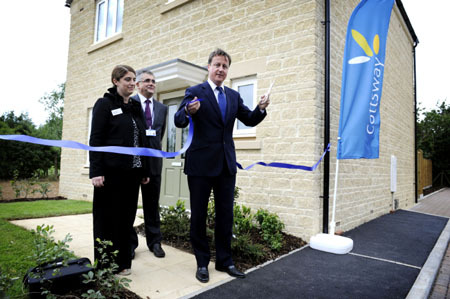 Prime Minster David Cameron has officially opened Cottsway Housing’s latest rural housing development at Blackditch, Stanton Harcourt. Featuring Tradical Hemcrete – a hemp and lime thermal walling system from Lime Technology – the scheme has been delivered as part of the Homes and Communities Agency’s Renewable House Programme. When opening the new development David Cameron said: “This development is innovative and creative and Cottsway is leading the way in providing green homes. It is vital to build new housing in rural areas to help sustain local services such as shops and Post Offices.” The scheme, built by contractor EG Carter and designed by architects Kendall Kingscott, is part of a series of schemes to create sustainable and comfortable homes with low running costs through the use of carbon neutral products and renewable technologies. 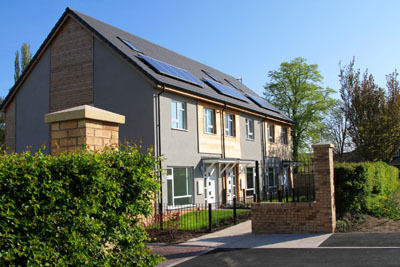 The homes have been designed to achieve level 4 of the Code for Sustainable Homes. A key element of the construction of the new homes was the use of Tradical Hemcrete for the creation of the walls of the homes. Developed by Lime Technology, the system offers a carbon negative method of creating thermally efficient buildings. Its carbon negative credentials are achievable through the use of hemp which absorbs CO² during its growth. EOS Energy has just received the go ahead to start work on an installation of a 50kW photovoltaic array on the roof of Coventry Cathedral. EOS will be working in partnership with the Cathedral and the Renewable Energy Technology Alliance (RETA). The array will consist of 178 panels and will be completed in time for HM The Queen's visit to Coventry in 2012. The Cathedral's executive director Jane Woodward said: "It's a Grade-I listed building and we are fortunate in Coventry because many cathedrals have quite steep pitched roofs behind shady parapets whereas ours is fairly flat. It will make us the first cathedral in country to have solar panels on the roof. "It's not just about saving money on our energy bills – we are committed to the idea of renewable energy and climate protection." This flagship project will form part of Coventry's efforts to get the city in good shape ready for the thousands of visitors expected for next year’s Olympic football games taking part at The Ricoh Arena (City of Coventry Stadium). The Cathedral already has an established partnership with EOS and has already received a payment of £1200 for commission on orders generated. 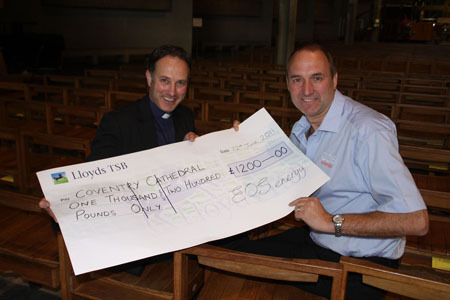 Picture: EOS Energy Director Dean Walton presents a cheque for £1200 to the Dean of Coventry Cathedral Tim Pullen. The University of Bedfordshire’s new Campus Centre in Luton, part of a £140 million redevelopment of University facilities, used Celotex CW4000 insulation. The investment is set to prepare the University for the future and ensure that it meets the standards of facilities, sustainability and ethics expected of today’s universities. The new building, one of the first phases of the plan, features a new student social centre, a 400 seat lecture theatre as well as catering facilities and exhibition space. 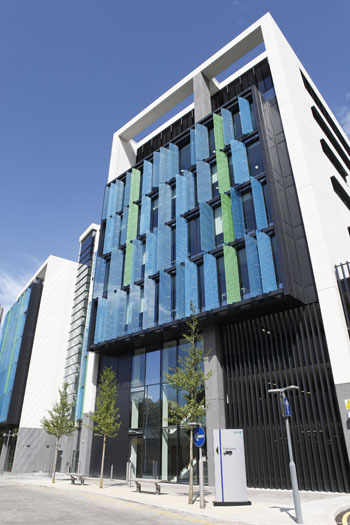 The building was designed by architects at RMJM, who set out to achieve a BREEAM rating of Excellent. To help achieve this, the building features natural ventilation and energy saving technology. Particular attention was paid to the building’s overall thermal efficiency, hence the Celotex PIR insulation choice. Built by main contractor Kier Marriott, specialist contractor Elliott Brickwork was tasked with undertaking all masonry work as well as installing the Celotex CW4000 insulation boards throughout the cavity walling – a task which required 2,500m2 of the company’s boards. The first PIR (Polyisocyanurate) insulation to achieve an A+ rating for its thermal efficiency, when compared to the BRE Green Guide 2008, foil faced Celotex CW4000 with a lambda value of 0.022W/mK has excellent thermal efficiency. As it does not trap moisture, which can happen with mineral fibre insulation, its effects are lasting, reducing heating needs, and thereby carbon emissions significantly for the long term. Alongside this, Celotex CW4000 has low Global Warming Potential and zero Ozone Depletion Potential. Though lightweight and easily cut on site, making for portability and ease of installation, Celotex CW4000 is also exceptionally hard wearing. Renewable materials have been successfully used for the construction of six new timber frame homes in York, built for The Joseph Rowntree Housing Trust by main contractor Mansell Construction Services. Having achieved part funding under the Homes and Community Agency’s (HCA) Renewable Houses funding stream, Tradical Hemcrete, a hemp and lime walling system from Lime Technology, was chosen as a zero carbon and cost effective alternative to conventional masonry cavity walls. Built on the site of a former residential care home, Domary Court represents the first use of Tradical Hemcrete in the North of England. Comprising two bungalows and four houses, the £1 million scheme was awarded funding under the Homes and Community Agency’s (HCA) Renewable Houses funding stream. To help the new homes achieve Level 4 of the Code for Sustainable Homes in an affordable and buildable way, Joseph Rowntree and Mansell investigated a number of sustainable build solutions. They found that Tradical Hemcrete would offer a commercially viable alternative to traditional masonry construction and greatly aid in achieving their goal. Developed by Lime Technology, Tradical Hemcrete is a hemp and lime wall thermal walling system. Carbon negative – possible as the hemp absorbs CO² during its growth – the system has 130kg CO²/m² less than conventional brick and block in a normal wall section. Tradical Hemcrete also has excellent thermal inertia, meaning that the buildings’ internal temperatures change very slowly helping to reduce the need for heating.